I used one of my favorite images from Whipper Snapper Designs and I also used some digital dp for the first time! This is Tricks&Treats from Echo Park Paper Co. I just love the unique colors for halloween! For my ribbon I used this totally gorgeous black sheer ribbon with the satin stripes from the Ribbon Club Assortment as well as a pumpkin that I cut from the Pumpkin Trim. The layout is this week's The Sweet Stop Sketch #73. The ribbon is a great accent! Oh my goodness Kerri this is CUUUTTE!!!!! LOVE this sweet image and I LOVE how you used the blue its FABULOUS for Halloween...You are sooo creative, I LOVE THIS darling creation!!! The layout is AWESOME too....:) Have a great Monday! What a fun image and card too and these ribbons are fab. 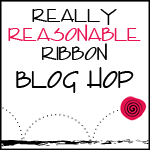 These ribbons are so much fun! Love the pumpkin one especially! Love how you cut the pumpkin out and put it on top of your bow, very cute! Hopping on to True Gifts from the Heart. Hop, hop, hop! Kerri, that's such a cute card. I love the little ghost popping up out of the pumpkin. Great coloring. Thanks! What an adorable card! I love how you cut one pumpkin out and laid it over the sheer black...brilliant! This is too cute! Love your coloring and that sweet image. I am totally loving that pumpkin trim. Awww, I love that image and the orange buttons too. Love it!! And your stitching is just so PERFECT!!! Kerri, what a cute card. I love the pumpkin in the middle of your bow. Such a great Halloweencard youve made. Sadly we dont really celebrate halloween here in Denmark. Hee hee So so cute! They don't look so scary but they sure are cute! Fun layout! What a cute card Kerri. The image is so funny, great job! Great card sweetie, love the layers and yummy papers. I promised I wouldn't, but I love that card so much I might have to run and get that image! You are SUCH an enabler! LOOOOOOOVE every bit of this! Super cute card. Love that stamp! This is stunning Kerri!! I so love your adorable image!! Awesome coloring and use of dp and ribbon!! is fun and beautiful! This is gorgeous Kerri! You have such a knack for making any occasion look elegant (yep, even Halloween!). This is fabulous, and has me getting ready for fall! What a sweet card! Unusual colours for Halloween and the ribbon is beautiful! This is so cute! I love the extra touch of the pumpkin cutout on the bow. I LOVE THIS! That is just the cutest image and I love how you just cut a piece of the pumpkin ribbon for an accent! Kerri what a great idea to use a single pumpkin! Love your card, the stitching is fabulous! Fun & adorable Halloween card. 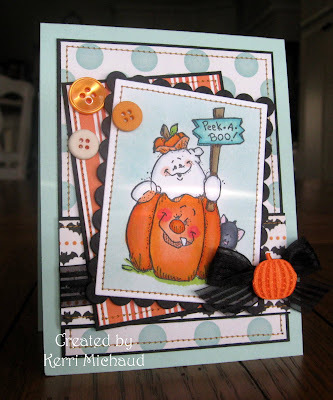 Love the cute image and the layout of your card Kerri! Great Halloween card...love the pumpkin on the bow and that great Pumpkin image. So cute and fun. I love your card, what a cute little ghost. He makes me smile. :) All of your detail is perfect. Thanks for sharing. I adore this! The colors are lovely! Oh Wow Kerri, I love your card! The image is so adorable, and your coloring is great! Beautiful ribbons and papers too! I see; you have all got the punpkin somewhere on your projects?! At least quite a few of you. And I also like the double - triple bow you made - supercool! Cute card! I love how you used the pumpkin on the black ribbon. this is a great card with not your typical halloween colors! LOVE that & i love how you cut off one of the pumpkins to use as an embellie for the middle of the other bow!!! Super fun - I love all the layers and I really love your use of blue with the orange. What a great card I am making notes as I hop along with alot of great ideas. Thanks for sharing!!! Aqua Mist and the polka dots take this one down to like a juvenile card from the others ones I was looking at...this is great for a kiddie and with the lil' peek-a-boo and the fun image. Man all the coloring you do - amazing. The card is super cute! Love the stamp and the buttons and of course, the ribbon!!!! OMG this is cute! I love it! The layout is too fun, the papers are perfect and your coloring just rocks!